Our first full day in Italy was kicking off in grand style! 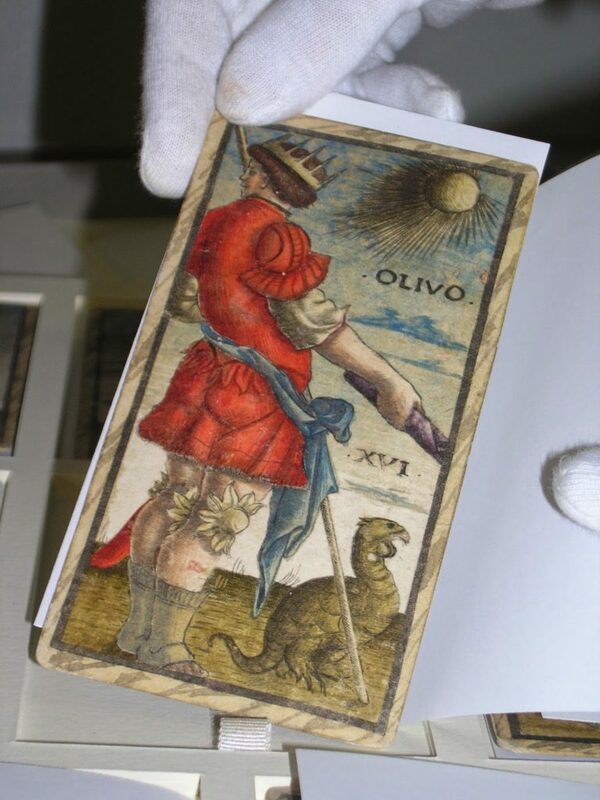 Half of our merry band would spend the morning at Il Meneghello, Milan’s marvellous Tarot shop, and half would visit the Sola Busca Tarot at the Brera. Then a bite of lunch and the groups swapped over. To say that I was excited doesn’t even touch the ankle-socks of how I was feeling. It was like a first date – what should I wear? Not such a barkingly mad question because we were going into a temperature-controlled room to meet the cards. I opted to take my fleece. Good decision. We got to the Brera early and stood in the tiny back courtyard as groups of Italian students and staff milled backwards and forwards like casually fabulous film stars. Eventually we were given the go-ahead to enter. Just hand over your passport and get a visitor’s badge. Half a dozen at a time, we silently trouped into the tiny elevator and slooooooowly climbed to the top of the Brera. 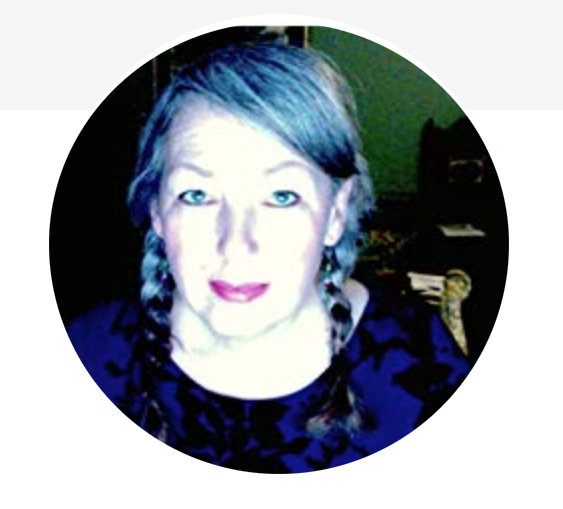 There we were ushered (again, in silence) past various offices and into a tiny, chilly room where the Director (more effortless Italian chic – black trousers and blouse) carefully lifted a ‘page’ of cards up for us to see. 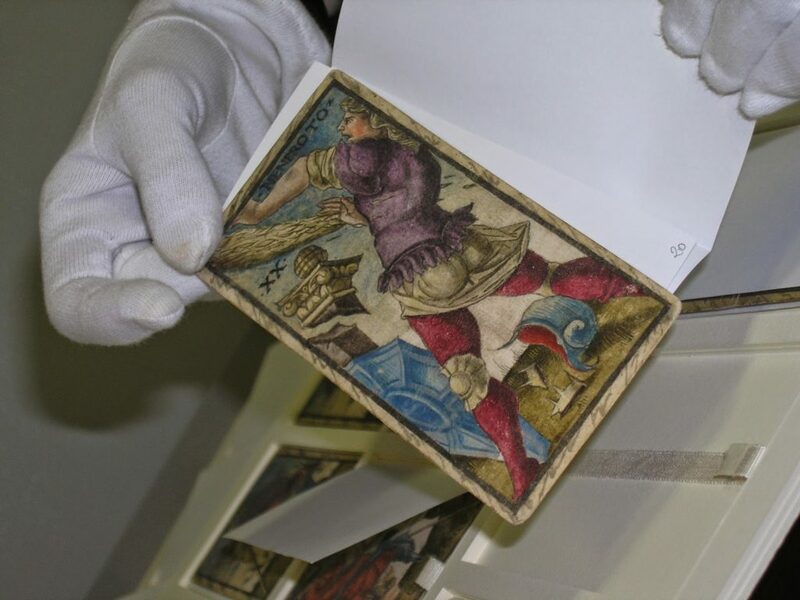 The 78 cards are nested in shallow trays, each one protected by a piece of acid-free paper, keeping the colours of these ancient cards absolutely PRISTINE. 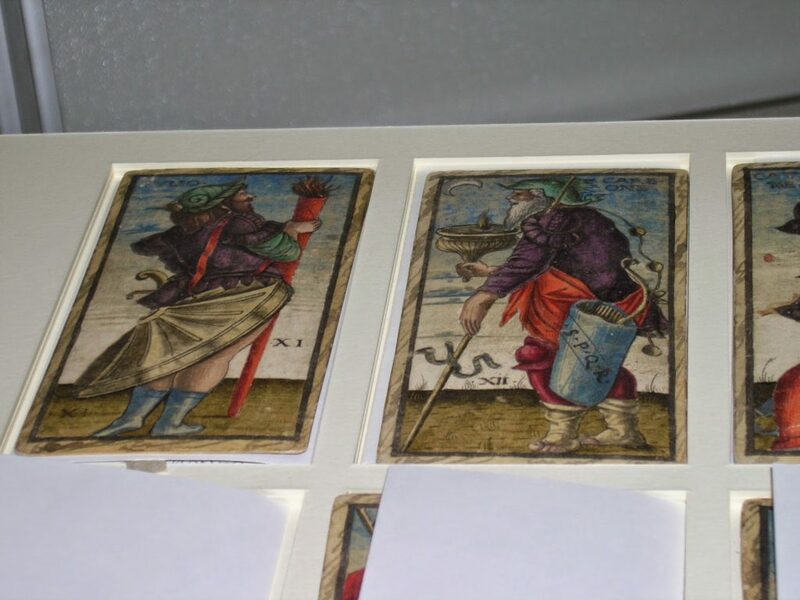 The cards date from the late 15th century (predating Shakespeare, for those of us with a hazy grasp of what happens where on a timeline!) and were purchased for E800,000 by the Italian government in 2009 and maintained at the Pinocateca di Brera. Although there ARE feminine figures within the deck, the cards comprise mostly of male figures – military men. The Minor Arcana are fully illustrated and there are clearly similarities in imagery between this ancient deck and the Rider Waite Smith. 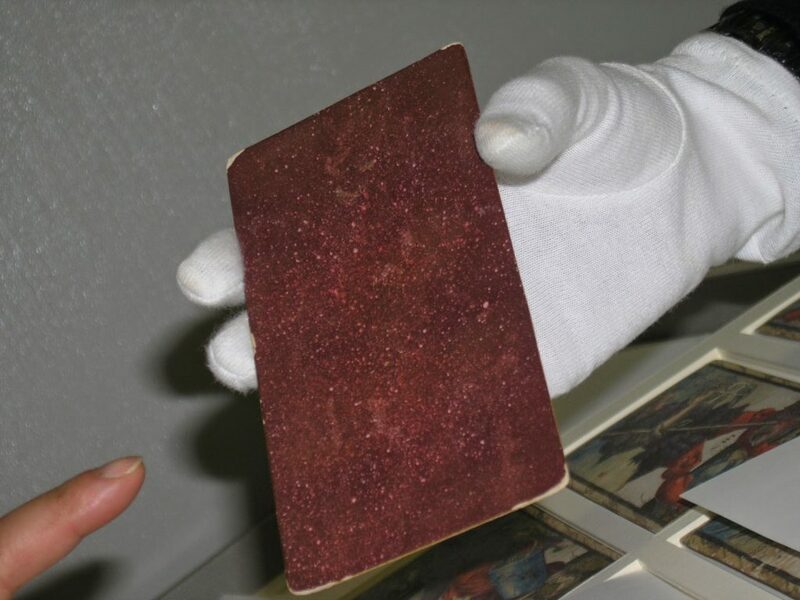 This is not surprising because black and white photographs of the deck were donated to the British Musuem in 1907 by the Busca-Serbelloni family (who owned the cards) and were most likely seen by the artist of the RWS, Pamela Colman-Smith. Look at the brightness of the colours! In close up – see how the paper folds over to protect them? 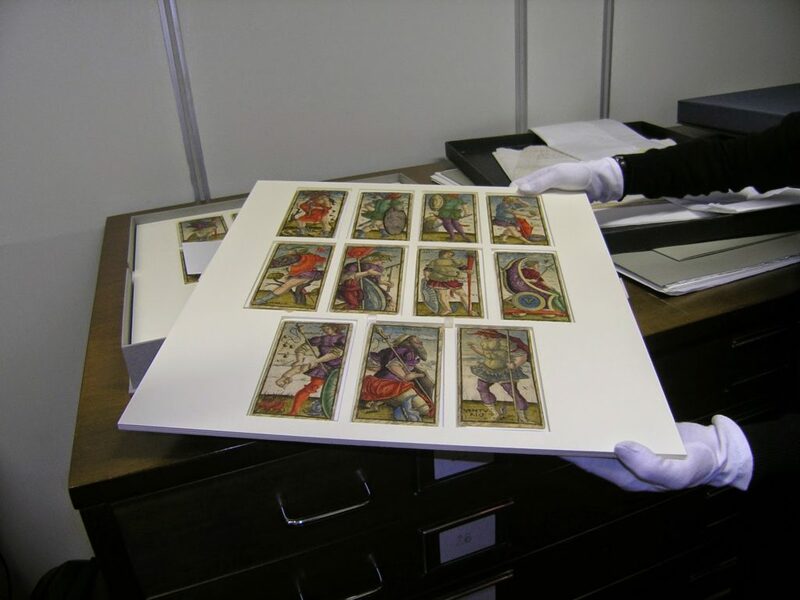 The back of the cards – check out that quivering finger! The names of the characters on the Sola Busca are largely a mystery to me, so I have bought books to help explain it all. Some are in Italian. I don’t speak Italian. But I guess I’ll have to learn! Bright colour! Look at that vibrant purple! Quite honestly, after I’d seen these cards, I was ready to get a flight back home. Nothing could possibly top them….. now I was as high as a kite thinking about the Mayer version of the deck that I was picking up from Giordano Berti later on in our holiday! 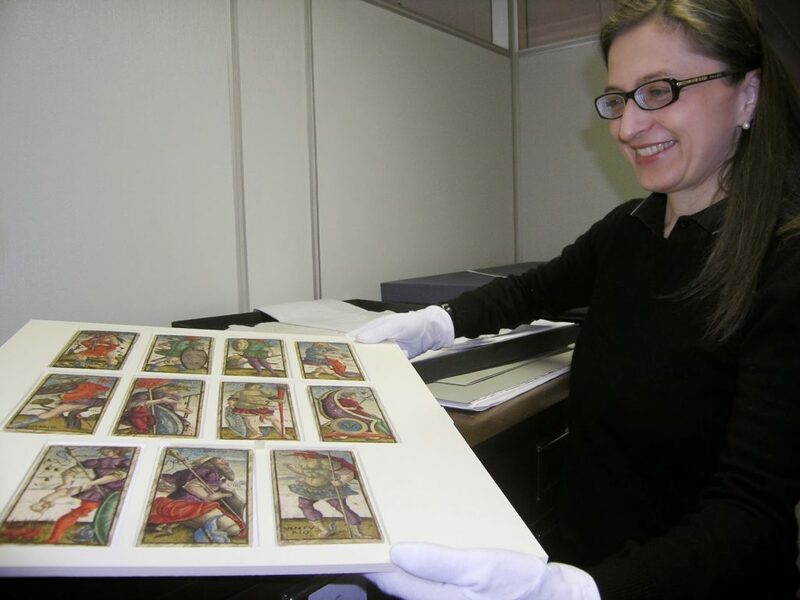 Could the Visconti Sforza cards that we would see at the end of the tour take my breath away?! Keep tuning in to find out!